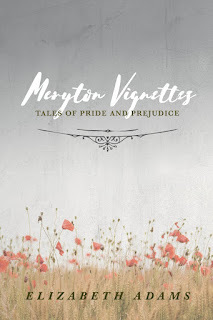 It's my pleasure to welcome Elizabeth Adams, with a look at her Meryton Vignettes, inspired by Jane Austen! I love short stories. They’re just the right length to read over breakfast or when you have a short break in a busy day. I love how they give you a whole story in a tiny, brilliant package, and can be just as enjoyable as a long novel without the lengthy wait for resolution. Angst in short stories is generally short-lived (unless it’s just a depressing story—I hate those), and knowing I’ll be out of the woods soon makes the hard stories easier for me to read. This collection is a mixture of light and dark. To make it simple for the reader to know what they’re getting into, I’ve divided the book into three sections, each with two short stories. Down the Road explores the future of certain P&P characters following the canon book. Alternate Paths twists canon just a little and shows what might have been, although I suppose both of those could fit into canon somewhere, if you really use your imagination. In the Dark is for stories with a murky edge. One is more humorous and a little twisted, the other could be downright disturbing depending on the reader’s perception. When writing, I usually get an idea or an image for a story and run with that. That was definitely the case with First Attachments; one of the scenes just popped into my head one day, in vivid technicolor with stereophonic sound, and I couldn’t ignore it. The rest of the story bloomed around that scene. It was a similar experience with He Had It Coming. I got the idea for the basic plot several years ago and ran with it. As I wrote the scene with Mrs. Wickham sewing up her own face after being beaten by her husband, I shuddered and felt my own skin crawling, it was so real to me. 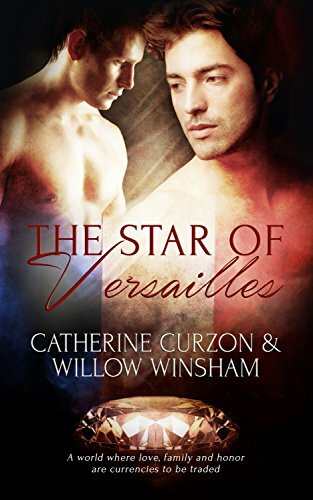 I never thought Wickham would maintain the illusion of a good husband for long, and once I got the idea of him as an abuser, it wouldn’t let me go. Part two of that story, which I happen to love immensely, came along a while later but with no less clarity. I saw Lydia surrounded by Darcy and Bingley children and how she would have changed through the years. I couldn’t wait to explore that scenario and see where she would take me. Occasionally, I get ideas when I’m reviewing something else. The stories about Charlotte and Caroline are the result of too many late nights trying to divine character depth from the pages of P&P. Last year, I was a member of a Jane Austen blog and did a series of character studies on my monthly posts. As I was studying Charlotte, I noted how she would likely make a great CEO in today’s world—her brute practicality, her ability to manage difficult people, her unending patience. And, of course, her ruthless willingness to seize an opportunity when it comes her way. I was incredibly curious about what life would be like for her once she went home to Meryton as Mrs. Collins. Would the neighborhood accept her as the rightful mistress of Longbourn? Would they feel she had gained it unfairly? Would they put her through a bit of hazing first, but then eventually draw her into the fold? For Caroline, I wondered what she would do with herself once her life’s ambition was no longer a possibility. Who would she talk to? How would she behave? What was running through that scheming head of hers? And, of course, I wanted to know what kind of man would want a woman like Caroline. I’ll admit that she was ridiculously fun to write. She may be vain and delusional, but she has a certain sass that could have made her an endearing character had she not used it for such vile purposes. Being able to play with so many characters is what I love about a short story. It is freeing and confining at the same time to only focus on a specific event or time period or character. That’s why I love short stories; I wouldn’t want to read an entire book about Caroline—she’s too abrasive for that—but I do enjoy a glimpse into her future and listening to her crazy thoughts for a minute. I just hope readers enjoy it as much as I do! 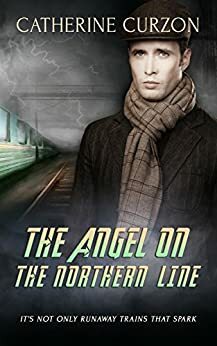 Charlotte ran her hand along the back of the sofa, her gloves skidding lightly along the upholstery. Her eyes scanned the room: the pair of chairs by the empty fireplace, the windows covered in lavender drapes, the aged mirror over the mantle. Of all this, she was now mistress. She gazed at the portrait of Mr. Bennet, painted in his prime, and remembered the man who had been her neighbor for twenty-seven long years, and who was now, by his failure to produce an heir, the means of her husband having his own estate. In a way, he could be credited with her having a husband at all. 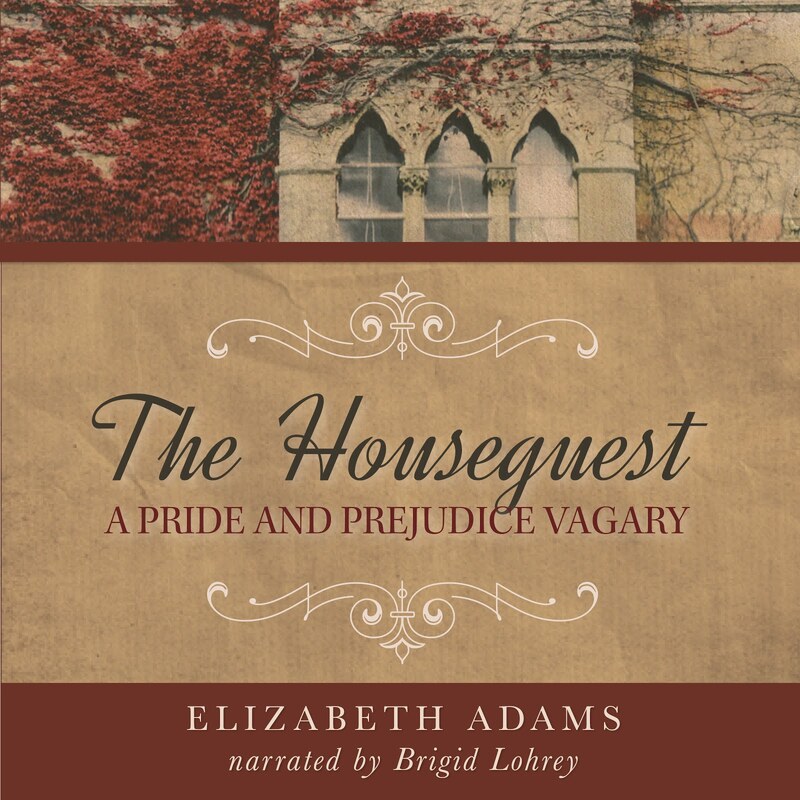 If he had not agreed to host Mr. Collins all those years ago, and supported Elizabeth’s refusal of her cousin’s proposal, Charlotte would have never met and married Mr. Collins. And now, seventeen long years after her wedding, she was here. The mistress of Longbourn. Second only to Netherfield Park, it was one of the most respectable estates in the area, belonging to one of its oldest families. And now, it was hers. “As well as can be expected, Mrs. Collins,” replied Mary Bennet. “Please, call me Charlotte. We are such old neighbors,” said Mrs. Collins kindly. Mary turned and left the room, leaving a bewildered Charlotte behind her. Charlotte shook off the feeling of guilt that had tried to settle on her shoulders and went upstairs to see to her children. She did not particularly enjoy her husband’s company, and she found the act of begetting children quite off-putting, but the results of her endurance were more than adequate recompense. “Mother, have you considered my request?” asked a voice to her left. She turned and looked into the face of Charlotte Rose, her eldest daughter. She was quite a pretty thing if Charlotte could say such about her own daughter. She had the look of her Aunt Maria about her. Before her mother could answer, the eldest of the Collins children ran off and began opening doors and comparing views. Charlotte shook her head at her enthusiasm. “Oh, to be fifteen again!” she mumbled to herself. She went into the nursery to help settle in her younger daughters. Two years after her marriage, she had been delivered of a girl, Charlotte Rose, Lottie to her family. Only eighteen months later she had born a son, William John. He was followed in two-year increments by Catherine Ann and Mildred Grace. Believing she had done her duty, and not wishing to die in childbirth as her years increased alongside her womb’s fecundity, Charlotte told her husband she wished for no more children. Having birthed four babes, he couldn’t possibly expect more of her. Mr. Collins acquiesced as she knew he would and no more was said about it. Unfortunately, when young William was but five years old, he succumbed to a fever and was buried in the churchyard. Charlotte was devastated. Within a year of his death, at thirty-seven years of age, Charlotte was with child. When she delivered a boy, she thanked God she would be spared further confinements. Lying in bed exhausted and spent, so happy and relieved was she that she didn’t hear her husband clearly at first when he suggested a name for the babe. She cuddled the white bundle closer to her and asked again what he had said. “William, after his father. It’s fitting, don’t you think?” Mr. Collins said with an ingratiating smile. He clearly had no idea of his suggestion being denied. “We already had a son called William. Do you not remember, Mr. Collins?” she asked, her voice calm. She remembered perfectly. How his skin had felt so hot and yet so thin, his cheeks flushed and his forehead clammy. She remembered how he had struggled for breath as she held him, praying with every fiber of her being for God to spare her only son. How she had bargained with fate, promising to be the best mother, the best wife, if only her boy would live! And how lost she had felt when the last ragged breath had left his body limp in her arms, his eyes unmoving, his chest eerily still. She had let out a mighty wail the likes of which Hunsford had never heard, lost to everything but the profundity of her grief. She had not been practical Charlotte in that moment. She had been nothing but a mother, deprived of her life’s greatest achievement and proudest joy. Her husband’s idiotic rambling brought her back to the conversation and his insulting suggestion. He spluttered on and Charlotte settled her eyes on the window, the church just visible in the distance, and next to it, the churchyard that held her beloved boy in its peaceful clasp. “No, Mr. Collins, we will not,” she said simply. He looked at her stupidly for a moment, but her eyes remained fixed on the window. “What was that, my dear?” he asked. Mr. Collins stood gaping at her, his mouth opening and closing like a fish. “I shall call him Lucas Adam, after my family and my grandfather.” She looked at the baby fondly. Mr. Collins had left the room then, and she had written it in the family Bible before he could argue further. Elizabeth Adams loves sunshine and a good book. If she had her druthers, she’d live in a villa on the Mediterranean and go tango dancing every Friday. She makes great cookies and often laughs at inappropriate moments. 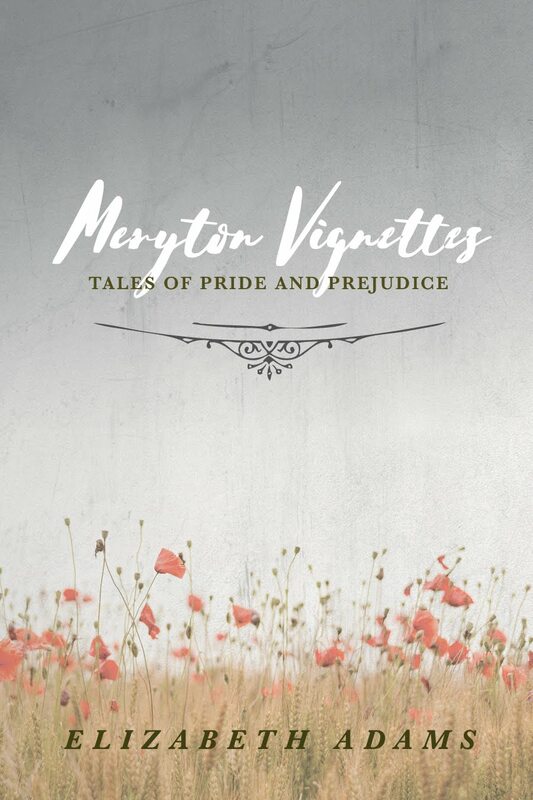 She is the author of The Houseguest, Unwilling, and Meryton Vignettes: Tales of Pride and Prejudice. 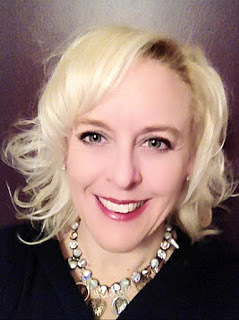 I'm delighted to welcome Anngela Schroeder, author of A Lie Universally Hidden! 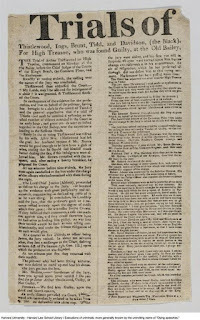 “Scandal sheets” are a term that have become synonymous today with the numerous forms of gossip pages that surround us in all shapes and sizes. Let’s also not forget the various kinds of digital platforms that we have today streaming “news” at us from all directions! Whenever I think about Lady Catherine and Elizabeth’s tumultuous relationship, I always wonder what the scandal sheets would have been saying about Darcy and Elizabeth’s relationship, don’t you? 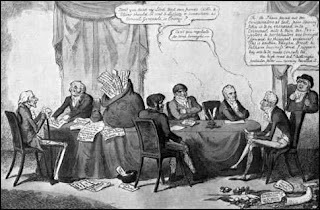 Obviously, gossip generated certain scandals and no one was looking to be involved with a scandal, even though the Regency Era was rife with them! Today I thought it would be fun if I shared a “scandal sheet” with your readers, based on my new book, A Lie Universally Hidden. 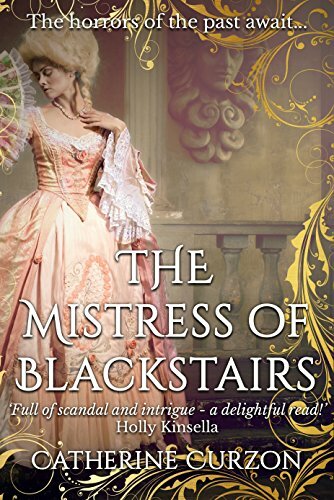 Of course we know that gentleman like Fitzwilliam Darcy were looking to avoid scandals, but that certainly doesn't mean it always kept him out of the gossip columns! Fitzwilliam Darcy was raised to never stray from the path set before him: ensure the continued prosperity of his estate, Pemberley, protect and educate his sister to become an accomplished woman, and marry the woman his mother chose for him—his cousin Anne de Bourgh. With a letter bearing his late mother’s signature, Darcy presumes his fate is sealed and prepares to wed one he does not love. However, his destiny begins to unravel when he glimpses a pair of fine eyes on a quiet, country road. Elizabeth Bennet is the second daughter of a respectable though insignificant gentleman. 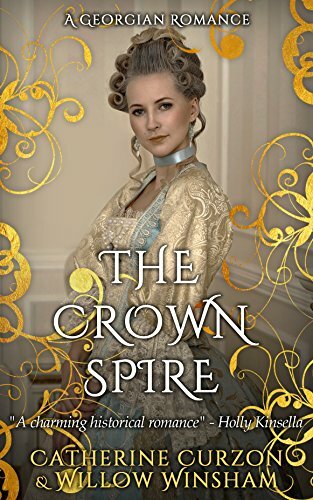 She is flattered to have captured the attention of a local squire, a childhood friend, and everyone believes her path is secure—until a handsome, rich gentleman arrives at a neighboring estate. Happenstance begets the unlikely pair together, bridging a forbidden love long past a mere friendship. 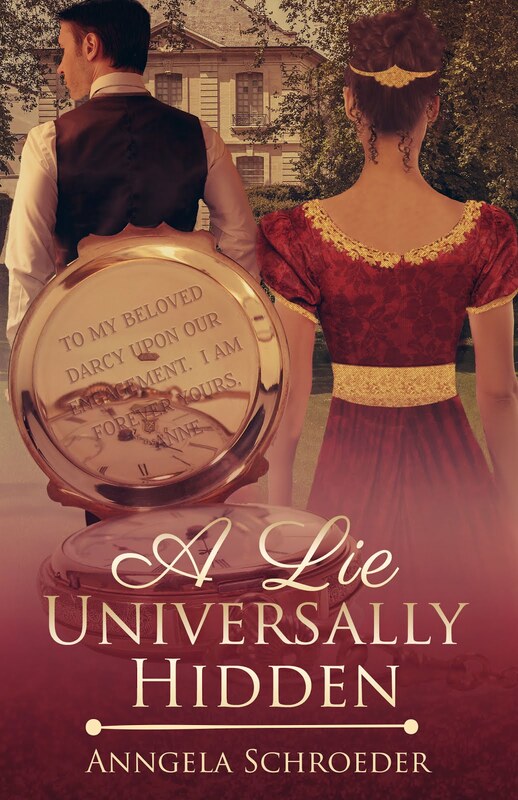 In “A Lie Universally Hidden”, two of literature’s most beloved romance characters are destined to marry for fortune and obligation rather than love. How will Darcy and Elizabeth fulfill their true destiny under such circumstances? Shall honor, decorum, prudence—nay, a signed letter from the grave—forbid it? 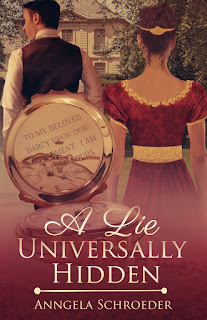 "A Lie Universally Hidden" is a Regency Romance suitable for most audiences, teen and up. I have a degree in English with a concentration in British Literature and a Masters in Education. I love to travel, bake, and watch college football with my husband of 16 years and 3 rambunctious sons. My goal in life is to make not only my children, but also my students feel that they are loved, and to bring magic into everyone's world. My weaknesses are yellow cake with chocolate frosting, French bread with real butter, and my father's Arabic food, namely grape leaves, and falafel. I live in California where I dream of Disney adventures and trips across the pond. I'm delighted to welcome Amy D'Orazio, author of The Best Part of Love, for a look at Rebellion and Radicalism in Regency England! Regency England is an undeniable source of fascination for many of us in modern times. What else would explain the enduring popularity and abundance of books, movies, and television shows based on that time? It was an era of romance, a time of elegance in dress and manners where beautiful ladies were courted by fine gentlemen in cities like London and Bath or in country estates. What none of us likes to consider is that if we lived in that era, it is more likely that we would have been part of the 95% of people who were not part of the world of the landed gentry. For that group of people, the era was not so romantic. 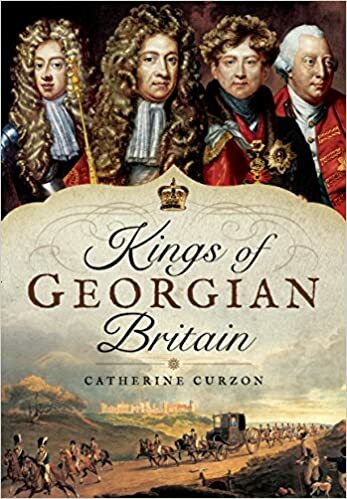 The landed gentry and titled nobility of England but this was a minor proportion of the overall population — less than 5%. However, although they were small in number, they were absolute in their control of the socioeconomic aspects of the country. Not only were they the lawmakers and enforcers, but they also controlled the economy. Servants and tenant farmers depended on them for wages and land, and many a tradesman was sunk by a gentleman who did not or could not pay his bills or did not pay them in a timely fashion. It would be easy to see why those within the lower classes were discontent with their lots in life, particularly as it was difficult for people to substantially improve their station. Many people in the lower classes had neither the time nor ability to educate themselves and, though some could elevate themselves, most were consumed by mere survival. The average person, born into poverty, would remain there until they died. Such circumstances as these are ripe for rebellion. In my book, The Best Part of Love, there is a group of radicals which is based loosely on the followers of a man named Thomas Spence. Born at the end of the 18th century, Spence believed in the common ownership of the land. He believed England should do away with the aristocracy and the landlords, and instead distribute equal parcels to every man, woman and child for their existence. He also believed the national government should have limited authority and limited resources. Although he had radical ideas, Spence wasn’t a violent person and did most of his work through the printing of various pamphlets and books designed to spread his ideas. It didn’t, however, keep him from being arrested and imprisoned several times and it was in prison that he died in 1814. In the later years of his life, he had attracted a band of followers, and in the years after his death, these followers began to meet in various locations around London where they discussed Spence’s ideas and began to make plans for a revolution of sorts. One of their first attempts at large-scale rebellion — in what some believe to be a test-run of sorts — was the Spa Field Riot of 1816. 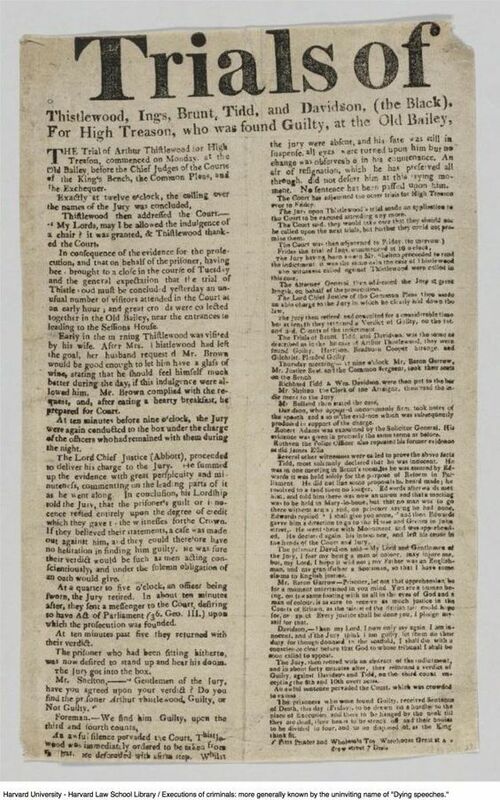 Two assemblies were held at Spa Fields, the first a peaceful gathering in which two men were elected to carry a petition to the Prince Regent, asking for relief from economic distress and parliamentary reform. The second gathering was less peaceful. The petition and the men who carried it were denied the interest of the Prince Regent, and once the populace was assembled, the Spencean Philanthropists took charge, encouraging unrest and dissent and eventually a movement on the Tower of London with the intent to seize control of the government. The effort failed as many of the assembled ran away, and the four leaders of the rebellion (Arthur Thistlewood, James Watson, Thomas Preston and John Hoppe) were arrested and, eventually, tried for high treason. They were acquitted on the basis that the only person who was able to attest to the fullness of their plans was a spy with a criminal record. Arthur Thistlewood was jailed later, from 1818-9 for challenging Viscount Sidmouth to a duel. 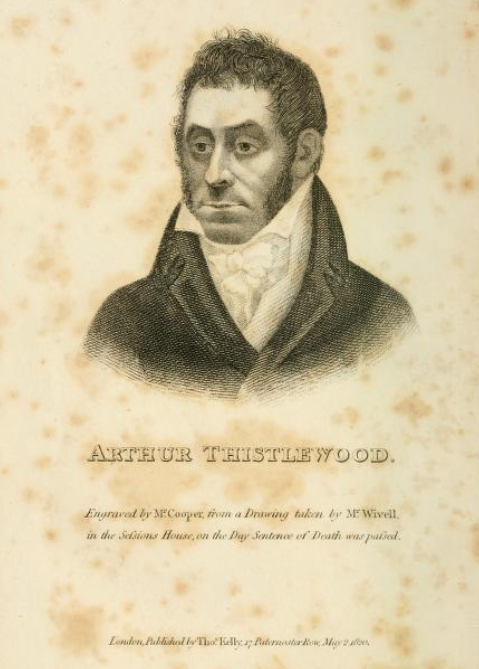 Following his release, Arthur Thistlewood was quick to resume his radical activities. Again meeting with his former friends, they planned a mass execution of the entire cabinet of Parliament along with Lord Liverpool, the Prime Minister at that time. In 1820, a dinner was planned at the home of Lord Harrowby on Grosvenor Street and, according to another of the conspirators, the plan was that Thistlewood would enter the dining room bearing a pair of pistols, a cutlass and a knife. He intended to behead every man therein and carry away the heads of Lord Castlereagh and Lord Sidmouth to display on Westminster Bridge. Fortunately for those men, the Spencean Philanthropists were discovered before they were successful. They had been, by this time, infiltrated by several men who acted as spies, and it was these governmental agents who arranged for a police presence at the site of the would-be massacre. 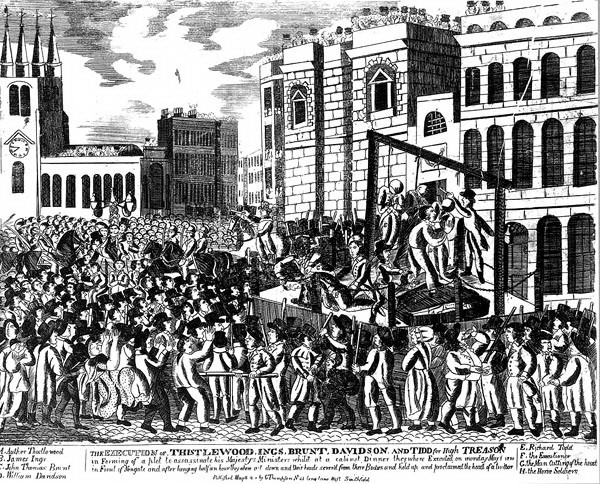 The main conspirators were apprehended and although some were sentenced to transportation, Arthur Thistlewood, Richard Tidd, James Ings, William Davidson and John Brunt were sentenced to death. They were hanged on 1 May 1820. 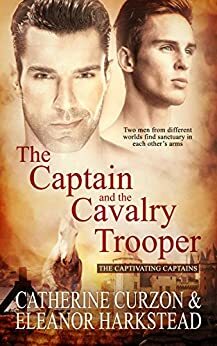 When Fitzwilliam Darcy meets Miss Elizabeth Bennet he has no idea that she — that indeed, the entire town of Meryton — harbors a secret. Miss Elizabeth, a simply country girl from a humble estate, manages to capture first his fascination and then his heart without him ever knowing the truth of her past. 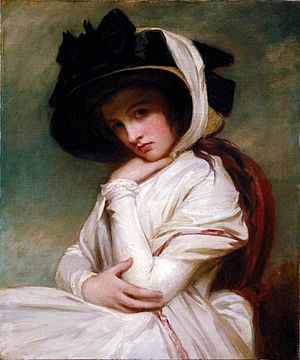 When she meets Darcy, Elizabeth had spent the two years prior hiding from the men who killed her beloved first husband. Feeling herself destroyed by love, Elizabeth has no intention of loving again, certainly not with the haughty man who could do nothing but offend her in Hertfordshire. 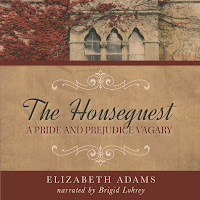 In London, Elizabeth surprises herself by finding in Darcy a friend; even greater is her surprise to find herself gradually coming to love him and even accepting an offer of marriage from him. 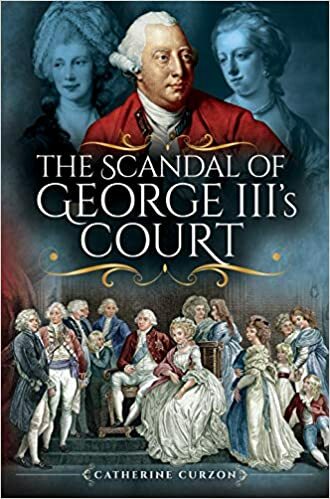 Newly married, they are just beginning to settle into their happily ever after when a condemned man on his way to the gallows divulges a shattering truth, a secret that contradicts everything Elizabeth thought she knew about the tragic circumstances of her first marriage. Against the advice of everyone who loves her, including Darcy, Elizabeth begins to ask questions. But will what they learn destroy them both? 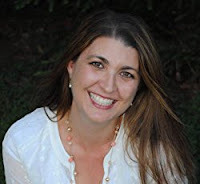 Amy D’Orazio is a former breast cancer researcher and current stay at home mom who is addicted to Austen and Starbucks in about equal measures. While she adores Mr. Darcy, she is married to Mr. Bingley and their Pemberley is in Pittsburgh PA.
She has two daughters who are devoted to sports which require long practices and began writing her own stories as a way to pass the time she spent sitting in the lobbies of various gyms and studios. She is a firm believer that all stories should have long looks, stolen kisses and happily ever afters. Like her favorite heroine, she dearly loves a laugh and considers herself an excellent walker. Whether you'd like to be regaled with tales of courtesans or meet the notorious Mr Wickham, don't miss these fantastic dates for your diary! Be inspired by heartfelt love letters from Lord Nelson to Emma, learn a traditional courting dance, or make a fabulous mask to beguile a stranger. 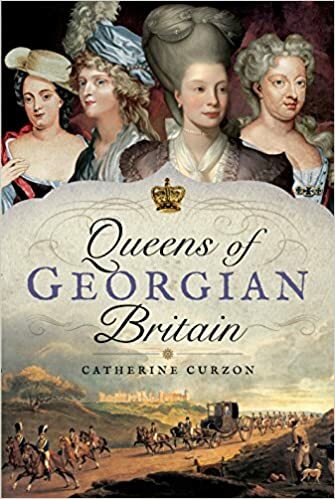 I'll be chatting to visitors about some famous Georgian courtesans, and telling a few eyebrow raising tales! Join ‘Mr Wickham’ and the Regency Rejigged dancers for a celebration of all things Austen, marking the bicentenary of the author’s death. 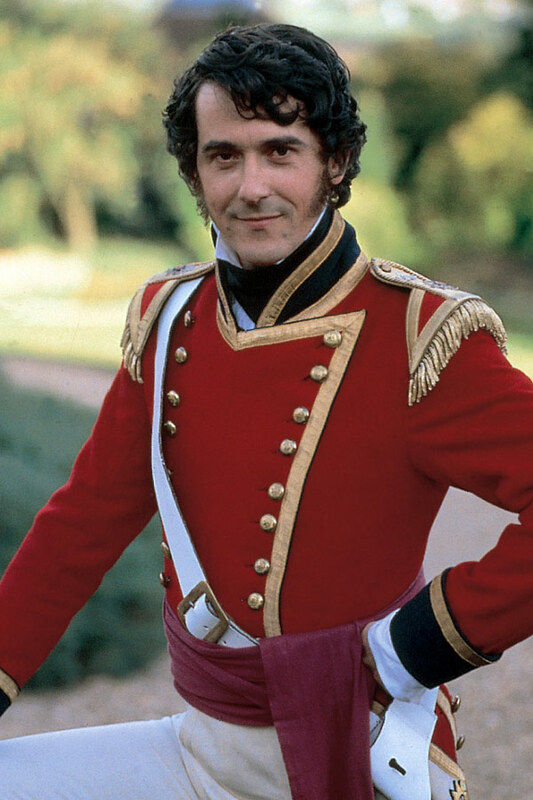 I'm thrilled to be chatting to Adrian all about his career and, of course, Pride and Prejudice! To find out more about the inestimable Miss Austen, do visit The Jane Austen Centre in Bath, Austen heaven!